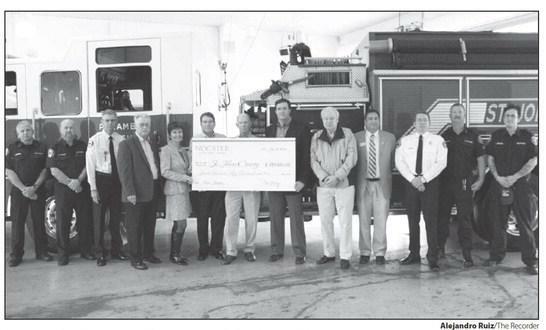 Last week, The PARC Group, master-developer of Nocatee, presented St. Johns County with a check to build the Nocatee St. Johns County Fire Station (to be located across from Nocatee's Splash Park). Both First Coast News and The Ponte Vedra Recorder reported on this ceremonial event to commemorate the exciting community addition. A small ceremony was held Jan. 14, commemorating the initial donation of funds for the construction of a new fire house in St. Johns County, located at 1055 Crosswater Parkway in Nocatee. Construction is expected to begin in April, and the fire house is expected to be finished the following year. The ceremony was a culmination of a fluid partnership between public and private enterprise for the betterment of the Nocatee community. The event was attended by Roger M. O’Steen, Chairman Chief Executive Officer for The PARC Group, Jerry Cameron Assistant County Administrator of Community Services, Jay Morris Chair Commissioner for District 4 and Rick van Brederode, who is a key player, along with the PARC Group in this endeavor to better serve the community in St. Johns County. 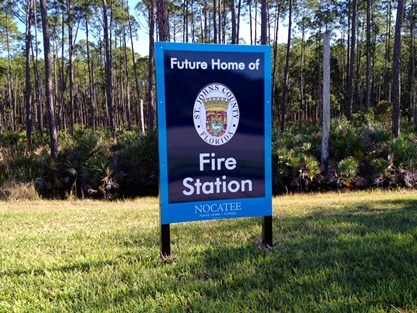 The nearest fire station to Nocatee is more than five miles away, which increased the cost of insuring homes in the community. The harsh truth, however, was that in spite of the need the funding simply was not there. "We don’t have the money for it in the county right now and we can’t pull it out of reserves," said Jay Morris, Commissioner for the district. Morris added that he has been a county commissioner for 3 years and this is the best public and private partnership he has ever been involved in. "The fire station will eventually be funded by Nocatee via their fire district fee, but due to this partnership we were able to speed up the process by nearly 3 years," said Morris. "I come from a business background and I never thought we’d be here eight months later accepting a check." This is a unique solution to a real need for EMT personnel in the community. Roger M. O’Steen, Chairman Chief Executive Officer for the PARC Group, added that this was the end result of work done with St. Johns County to devise a method by which the community could be served better and faster in emergency situations. "We put together a mechanism for funding the fire station and the end result is evidenced today with the initial deposit of $750,000 toward the project," said O’Steen. "I interface with a lot of the residents in the community and other communities out here and everyone is really appreciative of what the St. Johns County Commission and PARC and Davis family have done. It’s a good thing," said Rick van Brederode, a Nocatee resident. "If you look at the demographics out there, places such as the Dell Community, which is an over 55 community, come to mind—and you realize the need for close-by rescue and fire fighting capabilities is imperative."